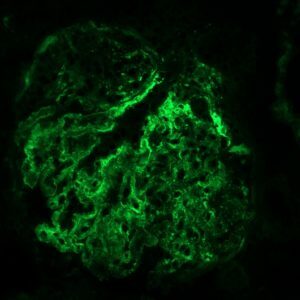 Membranoproliferative glomerulonephritis (MPGN) is a type of glomerular injury caused by immune-complex deposition on the luminal (subendothelial) surfaces of capillary walls and the resultant inflammatory response. Immune complex deposits are composed of mainly IgG and antigen. The source of the antigen is often suspected to be exogenous (associated with an infection). In some cases, the antigen might be endogenous. Immune complex deposits activate the complement system, which attracts inflammatory cells resulting in a hypercellular appearance of the glomerular tuft. Histologic appearance – Endocapillary hypercellularity (within capillary lumens) and thickening of glomerular capillaries by the immune complex deposits or by GBM remodeling. Endocapillary hypercellularity can be due to circulating leukocytes, endothelial cell hypertrophy, and / or interposed mesangial cells within the capillary that encroach upon or obliterate the lumen. Increased cellularity is most often diffuse, but can be segmental or global. Capillary wall remodeling is characterized by double contours of the GBM, best visualized with JMS. Other lesions that might accompany MPGN include glomerular synechiae, hyalinosis, crescents, presence of pyknotic debris, as well as periglomerular inflammation and fibrosis. TEM and IF are needed to identify the presence of immune complex deposits and are needed to differentiate MPGN from other types of membranoproliferative patterns of glomerular injury. These patterns have similar histologic appearances but lack definitive evidence of immune complex deposition. The most consistent initial clinical feature of MPGN is the presence of moderate to marked proteinuria (typically UPC > 2); however, the constellation of clinical findings is often more severe in dogs with MPGN vs. other categories of glomerular disease, with azotemia and hypertension often being present. Rare cases can have a UPC as low as 0.5. Other common clinical findings include low antithrombin activity, hypercholesterolemia, and edema/ascites. Dogs with ICGN frequently retain adequate concentrating ability. MPGN may be associated with infections, such as Leishmaniasis and Lyme nephritis. Dogs <1 year of age are unlikely to have MPGN. Beagles have been reported to have familial MPGN. 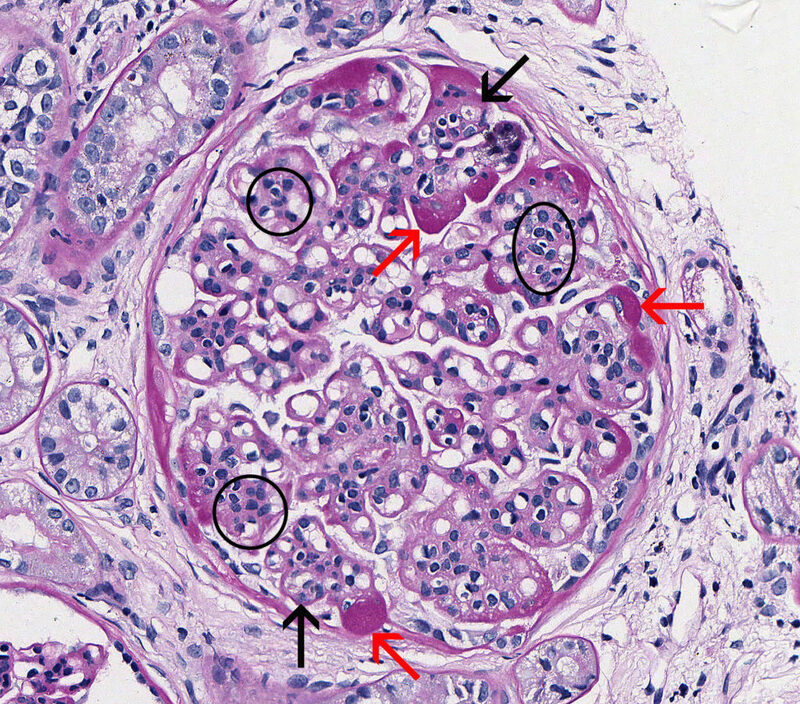 One element of evaluating (and reporting) the pathologic findings for glomerular disease is assessing (and describing) the severity and / or “stage” of the disease process within the glomerulus. For some patterns of glomerular injury, the severity of the glomerular lesions is largely a function of the features exhibited along a temporally linear dimension of pathologic changes. In amyloidosis for example, severity is mainly a function of the amount of amyloid deposition within the glomeruli and the degree to which glomerular capillary lumens are occluded. In membranous GN, as another example, severity is mainly assessed by the degree of GBM remodeling induced by the presence of immune-complex deposits. Hypercellularity – this dimension involves the number, location, and types of cells that are present in the glomeruli in excess of what is expected in normal glomeruli, as well as evidence of cellular injury (eg, pyknotic debris). Capillary wall remodeling – this dimension involves the degree and extensiveness of changes in the structures that compose the peripheral capillary wall; namely wall thickening, double contours of the GBM, cellular interpositioning. Sclerosis – this dimension involves the degree and extent of changes that are thought to be irreversible, namely synechia, and segmental or global sclerosis. 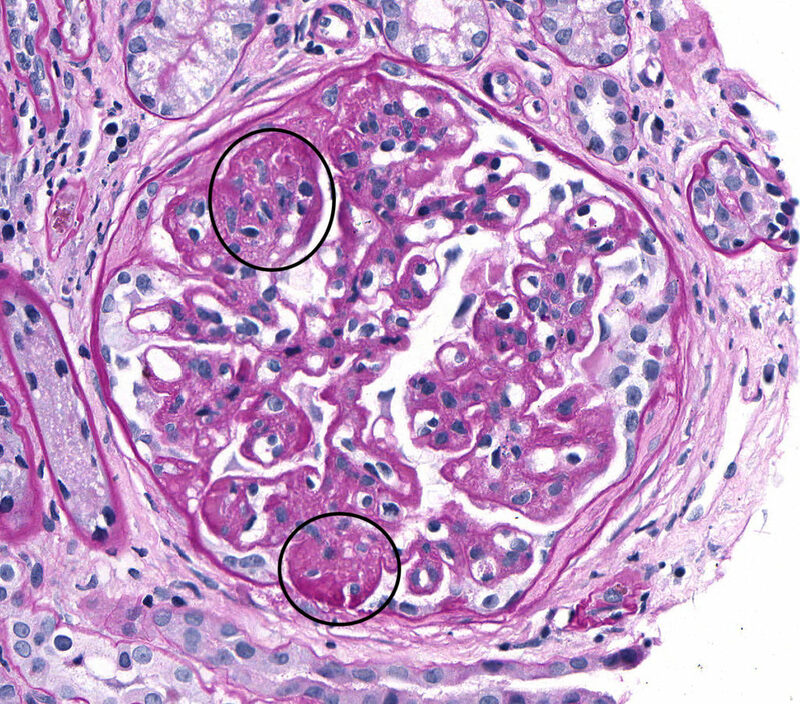 FIG.1A (HE): Active MPGN: Capillary lumens are frequently narrow or indistinct due to increased cellularity which includes endothelial hypertrophy as well as many circulating neutrophils (circled). FIG.1B (PAS): Active MPGN: Segmentally, capillary lumens are obscured by increased cellularity. Contributors to hypercellularity include circulating leukocytes [neutrophils (small circle) and mononuclear cells], hypertrophied endothelium and increased numbers of mesangial cells (large circle). 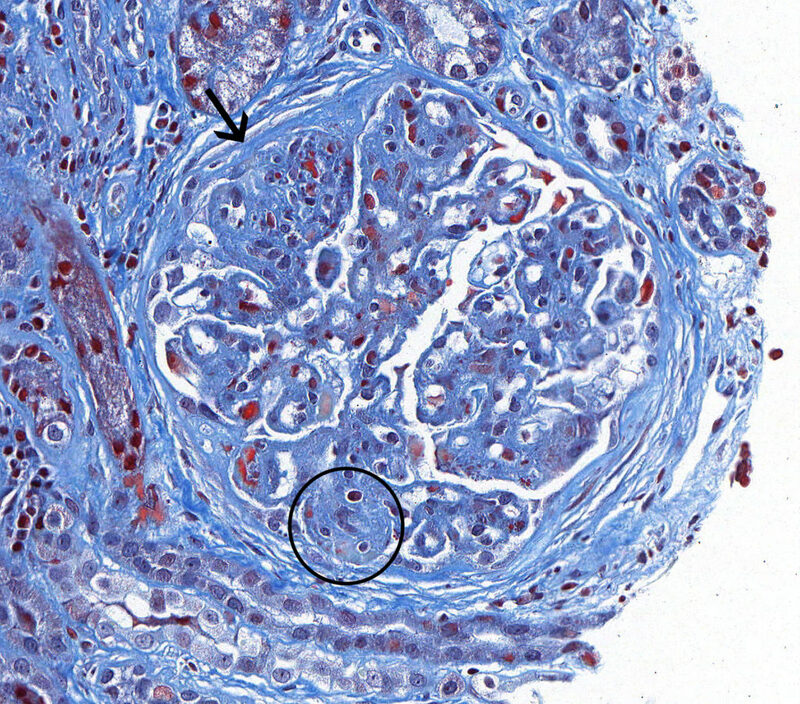 FIG.1C (MT): Active MPGN: Segmental hypercellularity (circled) with absence of periglomerular fibrosis and glomerulosclerosis are observed. 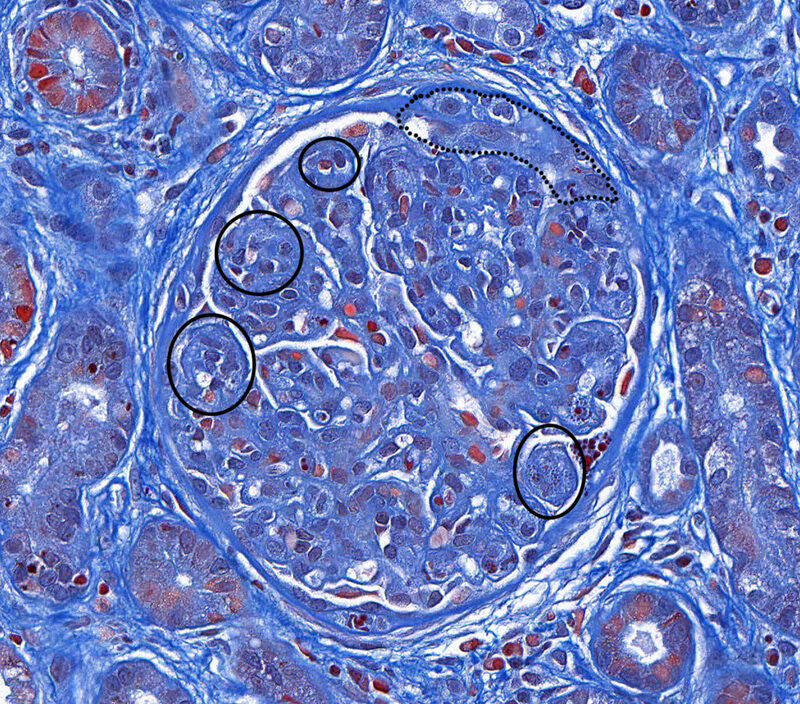 FIG.1D (JMS): Active MPGN: In addition to hypercellularity (circled), the JMS stain shows segmental GBM remodeling which is characterized by uneven inner and outer contours of the GBM (arrows). FIG.2A (HE): Chronic-active MPGN: There is global hypercellularity (circled), thickening of the GBM, a crescent within Bowman’s space (outlined) and synechiae. 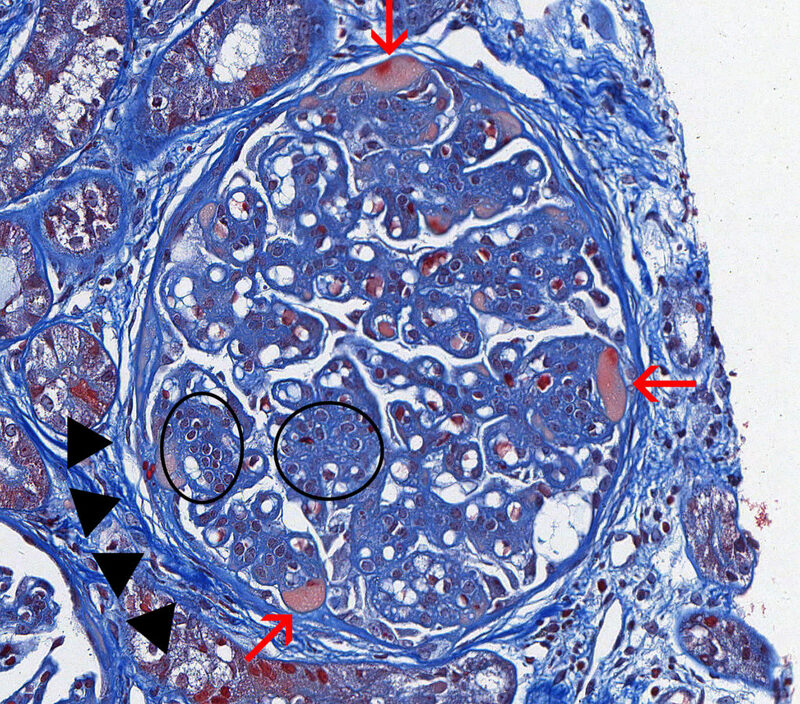 FIG.2B (PAS): Chronic-active MPGN: Global hypercellularity (circled), in both the endocapillary and mesangial compartments, accentuates the lobules of this glomerulus (i.e. glomerular lobulation) resulting in a clover-leafed appearance. Additionally there is a crescent characterized by segmental epithelial hypertrophy and mononuclear inflammatory infiltrates within Bowman’s space (outlined). 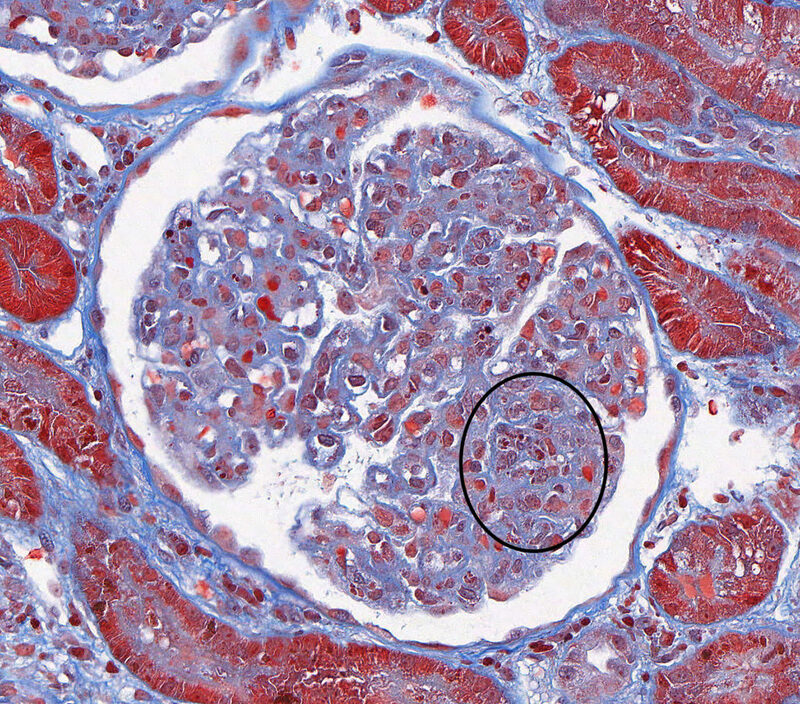 FIG.2C (MT): Chronic-active MPGN: The trichrome stain highlights the hypercellularity (circled) resulting in a lobular appearance of the glomerulus. The crescent is outlined. There is also periglomerular fibrosis, indicative of chronic injury. The generalized blue color in this particular case is likely a result of variability of the staining technique. 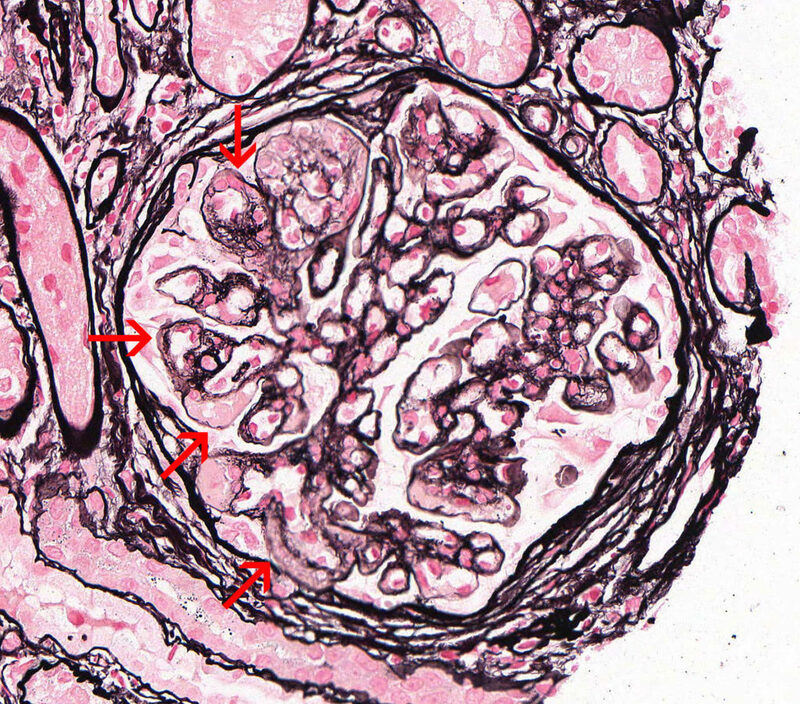 FIG.2D (JMS): Chronic-active MPGN: In addition to endocapillary hypercellularity the JMS stain shows evidence of capillary wall remodeling which is termed double contours (circled). Double contours occur when there is subendothelial cellular interpositioning, typically mesangial cells, as well as new subendothelial basement membrane deposition. 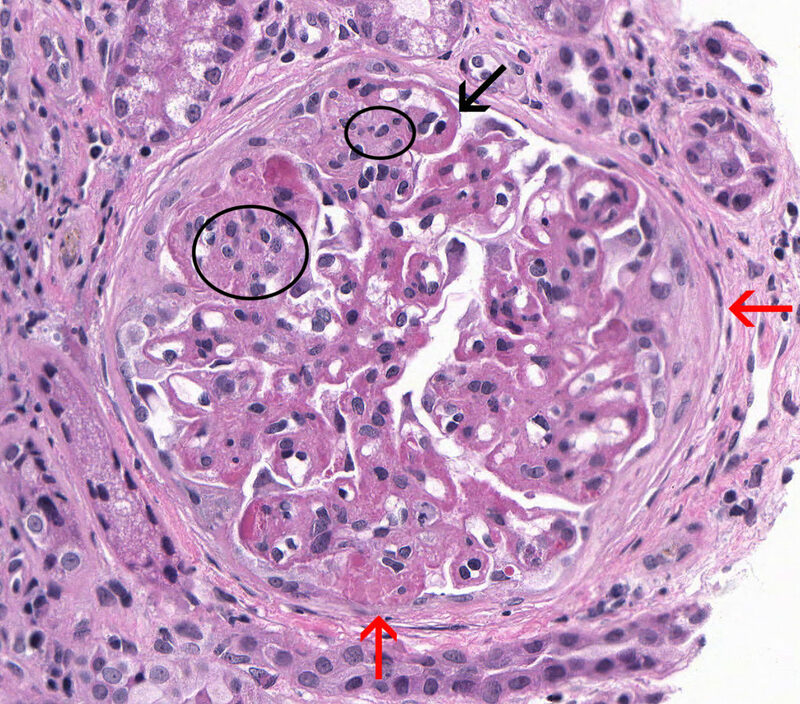 FIG.3A (HE): Chronic MPGN: This glomerulus demonstrates an accentuated lobular pattern, resulting in a clover-leaf morphology due to mesangial (circled) and endocapillary hypercellularity (black arrows). Mesangial hypercellularity is diffuse while endocapillary hypercellularity is segmental. Multifocally peripheral capillary loops are expanded by plasma (hyalinosis) (red arrow). 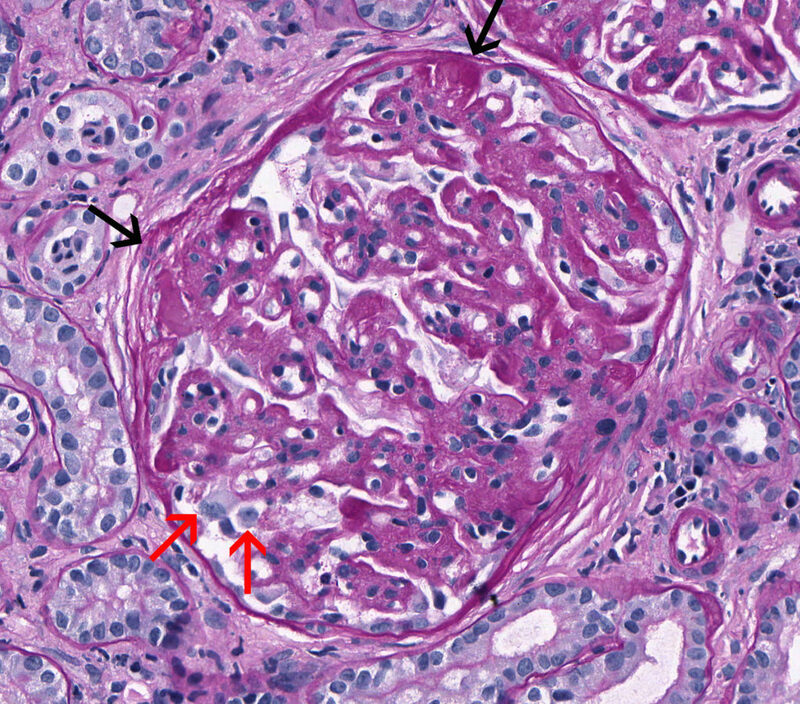 FIG.3B (PAS): Chronic MPGN: This glomerulus demonstrates mesangial hypercellularity (circled), endocapillary hypercellularity (black arrows), and a globally thickened GBM. Hyaline material in peripheral capillary loops is PAS positive (red arrows). FIG.3C (MT): Chronic MPGN: This stain highlights the accentuated lobular pattern, moderate global thickening of the GBM, and hyalinosis of peripheral capillary loops (red arrows). 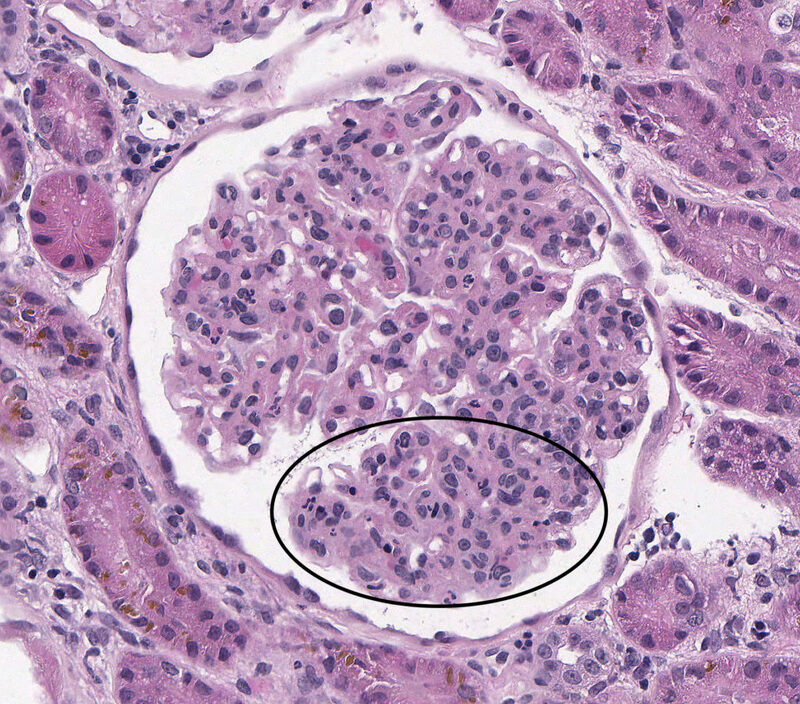 There is moderate mesangial hypercellularity (circled). Hyaline material accumulates between the endothelial cells and GBM and appears orange to peach with MT. Additionally there is moderate circumferential fibrosis of Bowman’s capsule (periglomerular fibrosis). 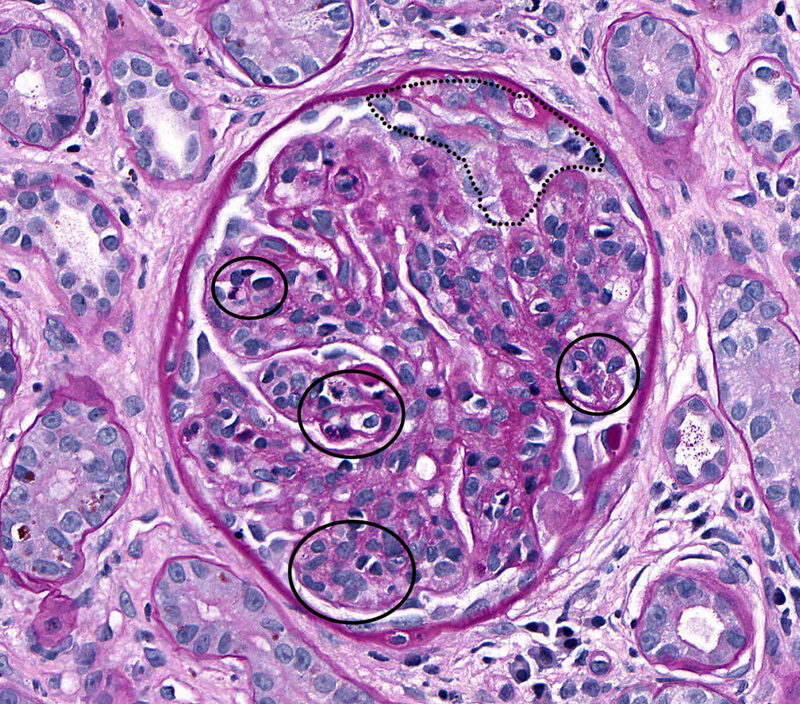 FIG.3D (JMS): Chronic MPGN: There is moderate mesangial hypercellularity (circles). This stain highlights the presence of double contours and thickening of the GBM (arrows). The double contours can be due to the presence of immune complexes, hyaline and cellular interpositioning within the GBM. FIG.3E (JMS): Chronic MPGN: Increased magnification of previous photomicrograph, demonstrating double contours of the GBM (circled). 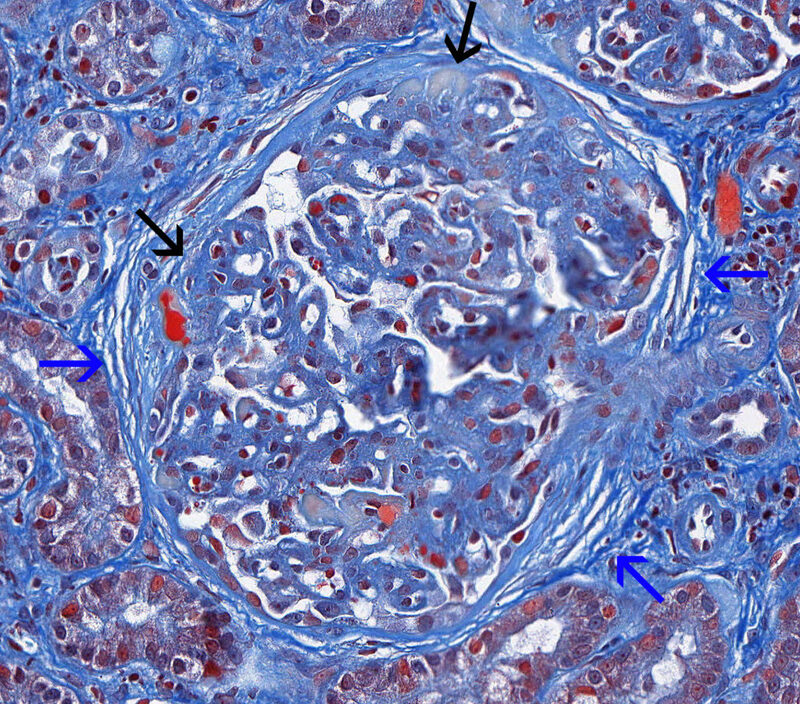 FIG.4A (HE): Severe, chronic MPGN: This glomerulus demonstrates thickening of the GBM, synechiae (black arrow), podocyte protein droplets (red arrow), a split Bowman’s capsule (blue arrows), and periglomerular fibrosis. FIG.4B (PAS): Severe, chronic MPGN: This stain highlights the globally thickened GBM, multiple synechiae (black arrows), and marked podocyte hypertrophy (red arrows). 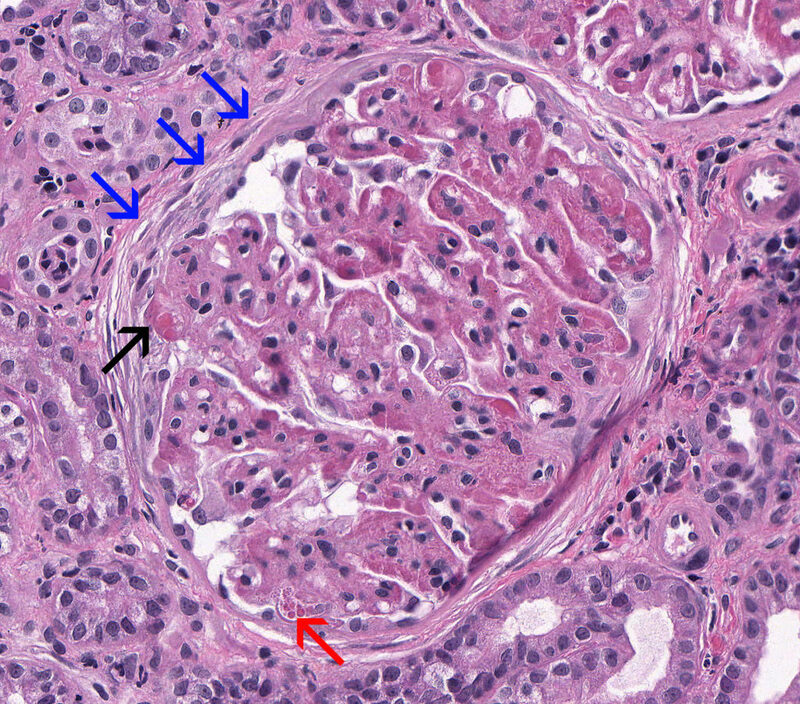 FIG.4C (MT): Severe, chronic MPGN: This stain highlights the presence of a split Bowman’s capsule and periglomerular fibrosis (blue arrows). There are multiple synechiae (black arrows). FIG.4D (JMS): Severe, chronic MPGN: The JMS method highlights the presence of multiple synechiae, a split Bowman’s capsule (red arrow), periglomerular fibrosis, and GBM duplication with mesangial interpositioning (blue arrows). Please note the glomerulus below is from the same dog presented in FIGURES 4A – 4D. 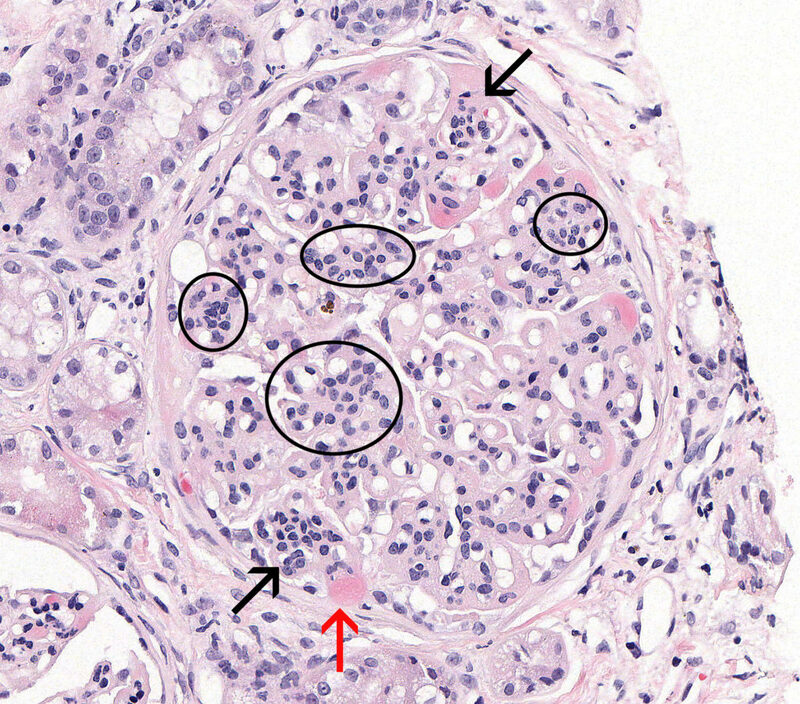 FIG.4E (HE): Severe, chronic MPGN: This glomerulus demonstrates multifocal mesangial hypercellularity (circles), a thickened GBM (black arrow), and multiple synechiae (red arrows). 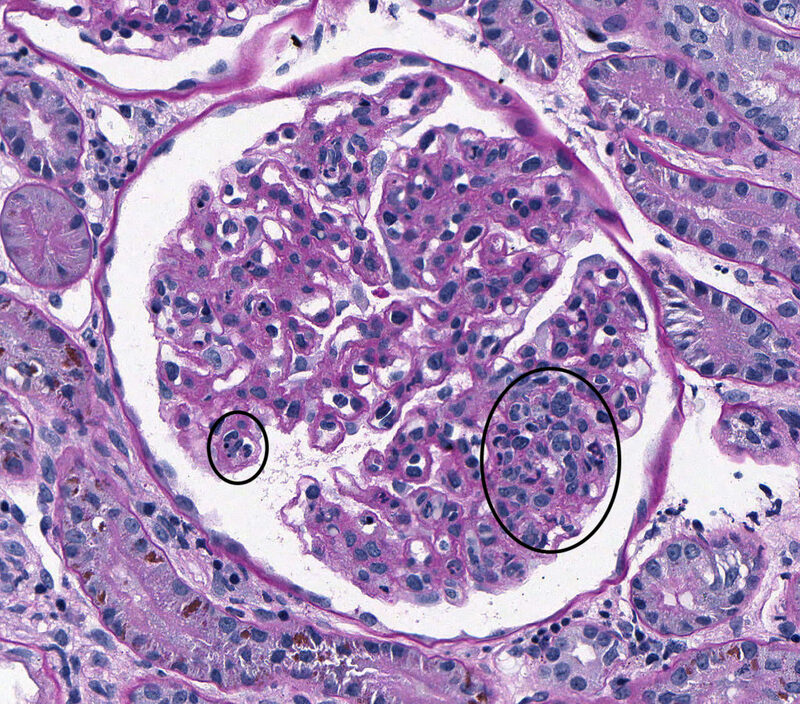 FIG.4F (PAS): Severe, chronic MPGN: There is GBM thickening and the mesangial matrix is segmentally expanded indicating irreversible sclerosis (circled). 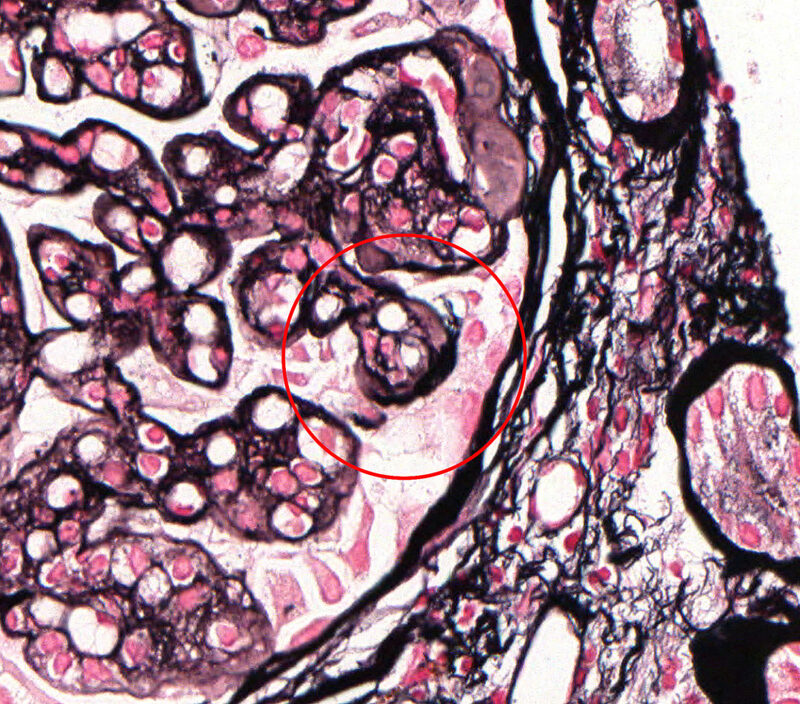 The hypercellularity is less prominent in this glomerulus. 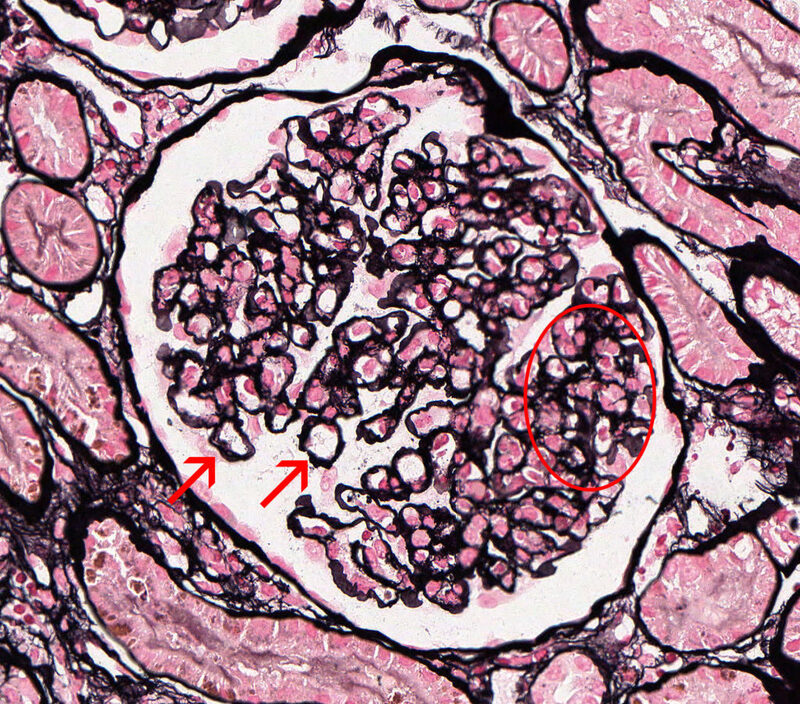 FIG.4G (MT): Severe, chronic MPGN: This glomerulus demonstrates synechia (arrow) and segmental sclerosis (black circle). 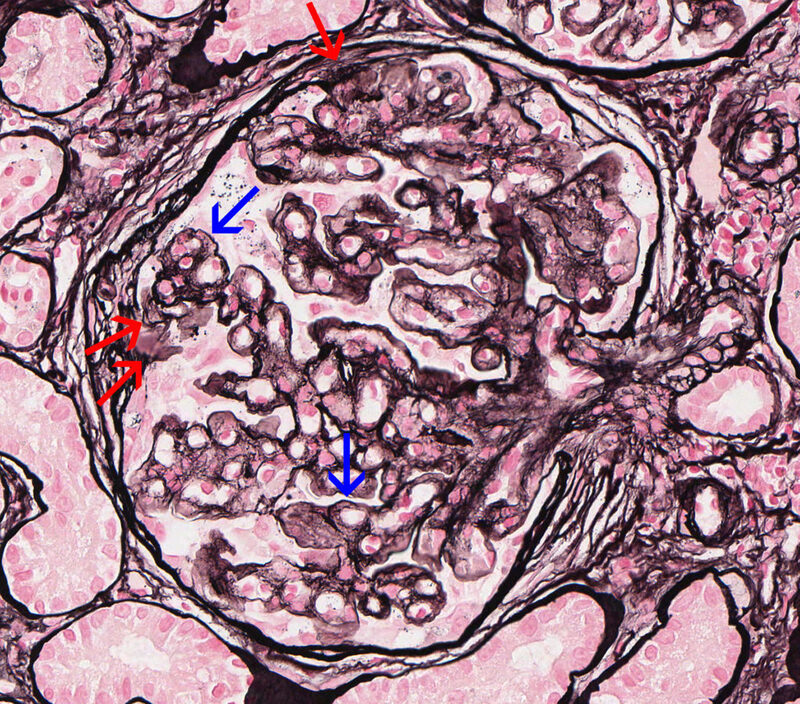 FIG.4H (JMS): Severe, chronic MPGN: This glomerulus demonstrates severe GBM duplication with double contouration (arrows). 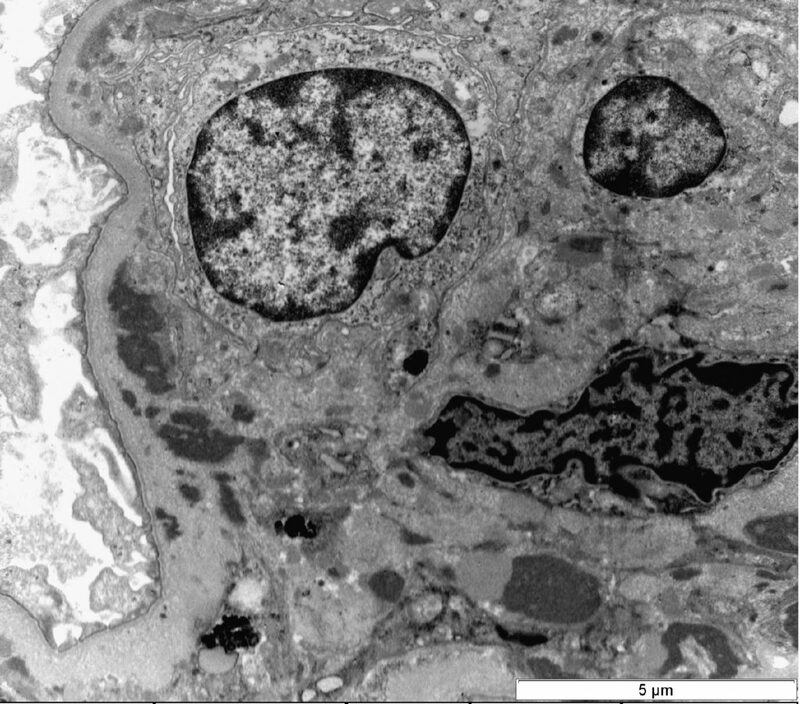 FIG.5A (TEM): Acute MPGN: There are subendothelial and mesangial electron dense deposits. This segment of the glomerular tuft is hypercellular. FIG.5B (TEM): Colorized version of above TEM image with subendothelial electron-dense deposits and variable electron-dense mesangial deposits (grey black). The mesangium (blue) is expanded compressing and invading the capillary. Endothelial cells (yellow) are swollen and obstruct the capillary lumen. Lastly, there is global fusion of podocyte foot processes (pink). 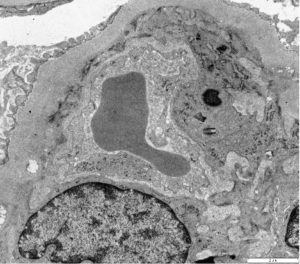 FIG.5C (TEM): Acute MPGN: Higher magnification of Figure 5A showing subendothelial and mesangial deposits, mesangial and endothelial proliferation. 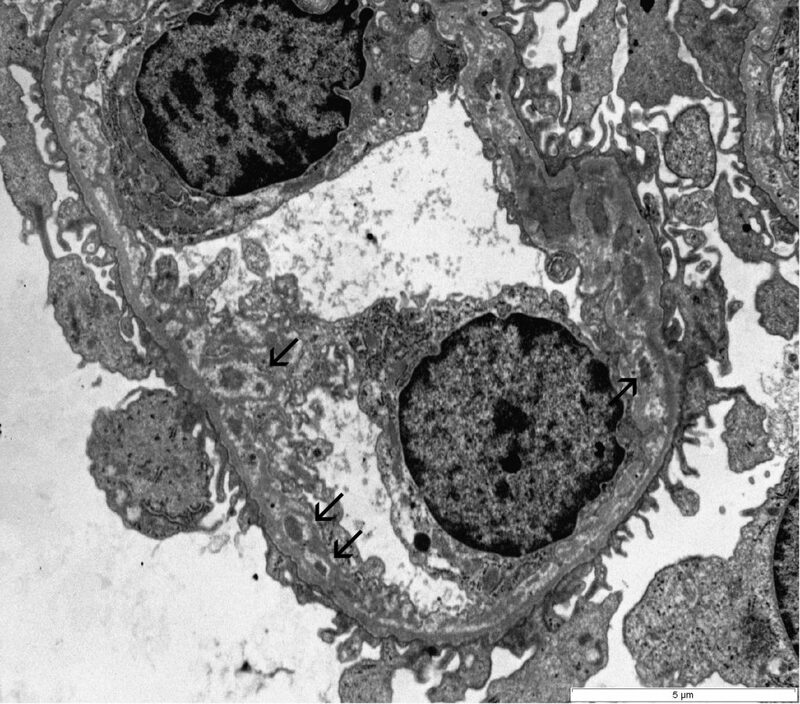 FIG.6A (TEM): This glomerular capillary loop demonstrates scattered subendothelial granular electron-dense deposits and synthesis of new GBM material by the endothelial cells (arrows). 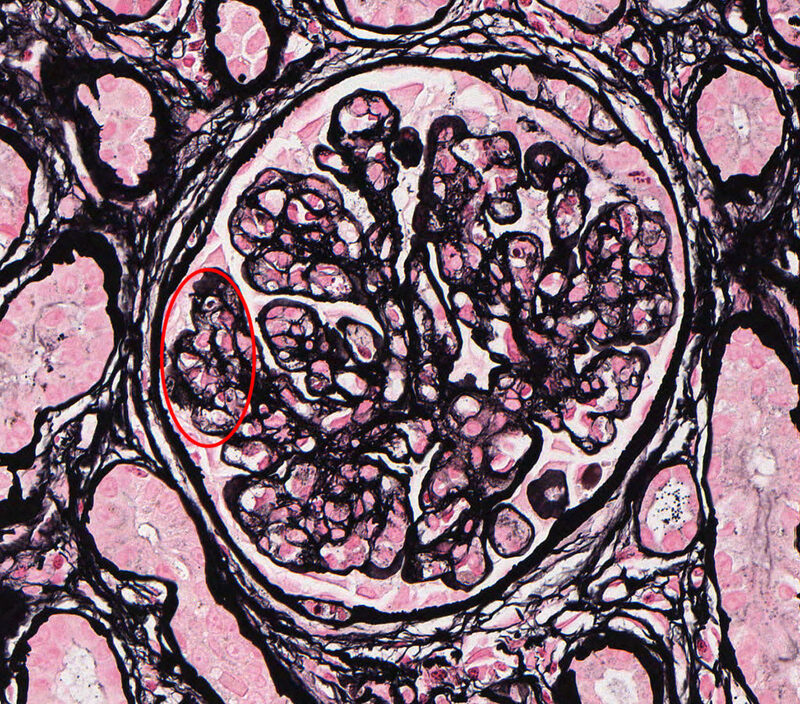 FIG.6B (TEM): Colorized version of above TEM image This glomerular capillary loop demonstrates scattered subendothelial granular electron-dense deposits with remodeling of the basement membrane (green). Remodeling consists of lamina densa encasing deposits and a circumferential lucency indicating dissolution of immune deposits. 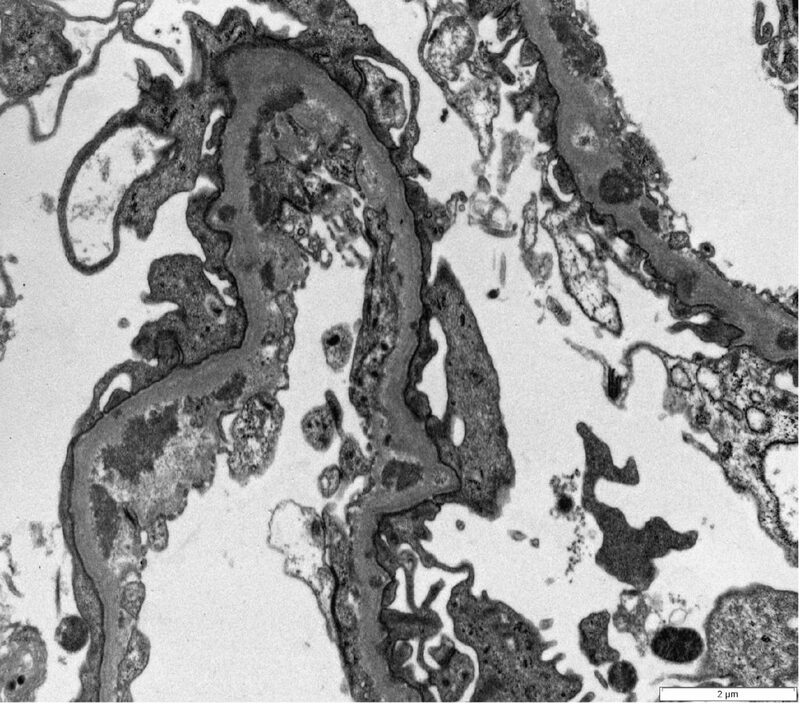 FIG.6C (TEM): These capillaries have many irregular electron dense deposits in a subendothelial location and global effacement of podocyte foot processes. FIG.6D (TEM): Colorized version of above TEM image. These capillaries have many irregular electron dense deposits. They are on the subendothelial aspect of the GBM (green). There is global effacement of podocyte foot processes (pink). Endothelial cells have lost their fenestrae (yellow). 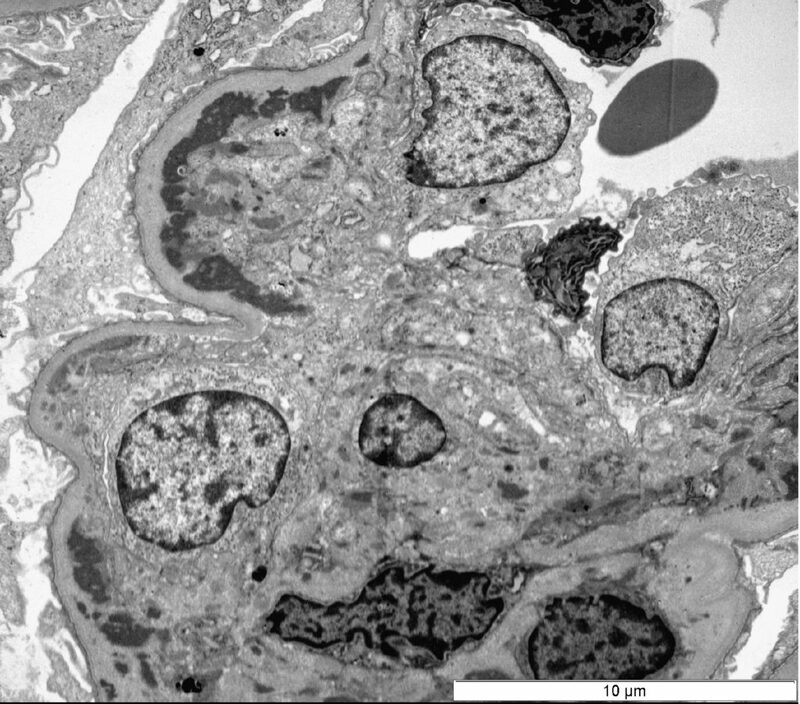 FIG.7A (TEM): MPGN: Membranoproliferative pattern of injury due to chronic MPGN with circumferential interpositioning of mesangial cell cytoplasmic processes. 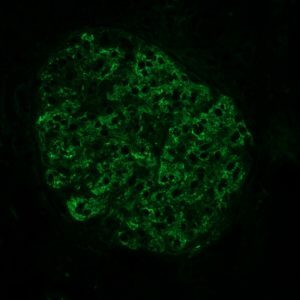 FIG.7B (TEM): MPGN: The GBM (green) is thickened due to remodeling and subendothelial electron-dense deposits. Additionally there is marked podocyte foot process effacement (pink) and microvillus transformation. 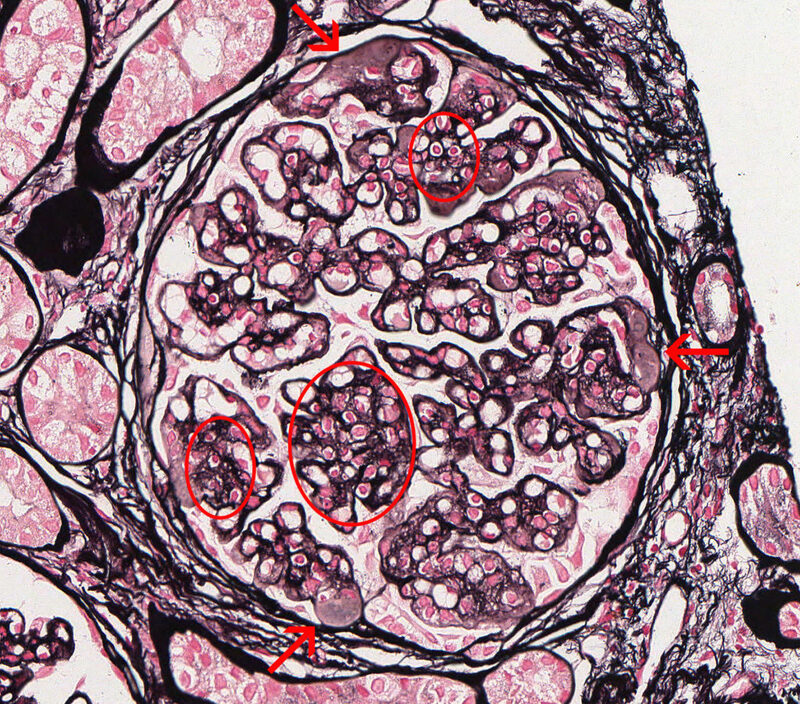 FIG.8A (IF for C3): There is strong granular labeling along capillary loops and in mesangial zones. 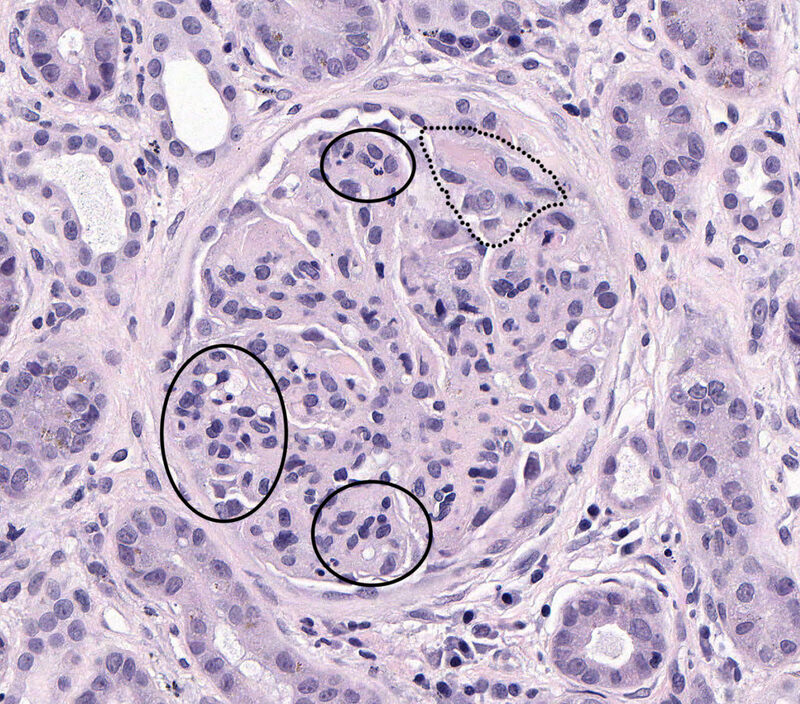 FIG.8B (IF for LLC): There is strong granular labeling along capillary loops and in mesangial zones. Atlas of Renal Lesions in Proteinuric Dogs by Rachel Cianciolo is licensed under a Creative Commons Attribution-NonCommercial-NoDerivatives 4.0 International License, except where otherwise noted.